Illegal immigrants caught in certain areas along the border are now charged with violating federal law and given criminal records before being deported. If they return to the United States and are caught, they can face prison time. Supporters of the program say its expansion will help secure the border. Opponents argue the program is costly and unconstitutional. TUCSON, Ariz. — Dozens of prisoners file into the Tucson federal courthouse. The sound of metal chains clanking and scraping against the floor reverberates off the whitewashed courtroom walls. Prisoners, migrants from Mexico and Central America, fill the jury box and six pews on the left side of the courtroom typically reserved for witnesses and audience members. The women sit in a separate pew in the center of the court, directly facing the judge’s bench. A stale stench permeates the austere courtroom. Most of the migrants have not showered since the U.S. Border Patrol apprehended them in the desert days ago. Their clothes are dirty and stained. The defendants don’t speak English and wear headphones to hear the court proceedings translated into their native language, which is almost always Spanish. The defendants wear shackles around their waists and ankles and handcuffs around their wrists. The chains prevent the defendants from raising their right hands when they swear to tell the truth. Each tanned face displays a particular emotion: confusion, fear, sadness, irreverence or humiliation. Some defendants shuffle their feet nervously; their shackles clink softly. Some stare at the gray carpeting or at the ceiling. And some sit motionless in the chilly courtroom. 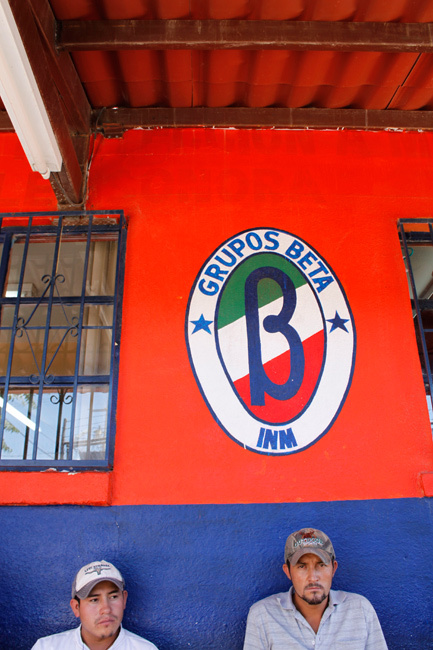 Two recently deported men sit outside the Grupo Beta station in Nogales, Sonora, Mexico. Many immigrants come to the government-run facility for aid after being deported. This is Operation Streamline, a federal initiative that attempts to deter border crossers by criminally prosecuting them. The little-known program was implemented in late 2005 by President George W. Bush. First-time offenders can be sentenced to a maximum of six months but are often sentenced to time served and deported. Repeat offenders can receive up to two years in prison but generally get from 10 to 180 days. If a repeat offender has a criminal record, he or she can receive a prison sentence of up to 20 years. The vast majority of illegal immigrants apprehended along the 2000-mile U.S.-Mexico border still receive voluntary deportations, an action with almost no legal repercussions. But expansion of Operation Streamline — with its criminal convictions for those caught crossing the border illegally — is being hailed as an antidote to America’s border security problems. Before Streamline, non-violent border crossers with no prior convictions who made it into the court system were administratively deported. Criminal prosecutions were reserved for migrants with criminal records or multiple re-entries. Much of this prosecutorial discretion is lost with Streamline, and as a result officials say misdemeanor immigration cases are overwhelming the federal district courts along the border. Supporters argue that Streamline gives teeth to federal immigration laws and helps break the “catch-and-release” cycle of repeat border crossers. Indeed, Arizona’s two U.S. senators are among those pushing for full prosecution of all apprehended illegal immigrants in the Border Patrol’s Tucson Sector, which accounts for the largest number of the nation’s annual apprehensions. But critics say the program is ineffective, costly, arbitrarily applied and possibly unconstitutional. The costs of expanding the program to include all apprehended undocumented immigrants would be substantial. In the Tucson Sector alone, the costs just to incarcerate the illegal immigrants apprehended in 2009 would have run at minimum into the hundreds of millions of dollars and could have topped $1 billion, according to News21 calculations based on figures provided by those involved in the judicial process. If everyone apprehended at the border in 2009 was put through Streamline, Arizona federal prisons would need an additional 51,000 beds on top of the 4,741 that currently exist. Similar expansions would be required in other states if they, too, fully implement Operation Streamline. Some judges, Border Patrol officers and attorneys who deal directly with the eight Streamline programs currently operating say expanding the program to cover all illegal immigrants would further overwhelm the judicial system. While misdemeanor prosecutions of illegal border crossers have increased dramatically over the past five years, prosecutions of more serious drug and gun charges along the border have declined. Those who go through Streamline in Tucson are generally selected not by what they did but where they crossed. The Border Patrol selects “no-pass zones” that are generally in high traffic areas. When agents reach a set number of detainees, other illegal immigrants who are apprehended are processed differently. Of the 400 to 600 illegal immigrants caught daily in the Tucson Sector, about 10 percent currently are prosecuted through Streamline. A December 2009 9th U.S. Court of Appeals ruling instructing magistrates not to take pleas en masse, resulted in some modifications. In Tucson pleas are taken individually but hearings are still held en masse. Some judges hearing Streamline cases admit to having qualms about the fairness of en masse hearings. The case is being appealed by multiple people who believe that the immigrants’ rights are still being violated. There is no uniform policy on who is prosecuted or how court appearances are handled. Each federal judicial district implements Operation Streamline in different ways. The U.S.-Mexico border spans from San Diego, Calif. to Brownsville, Texas. 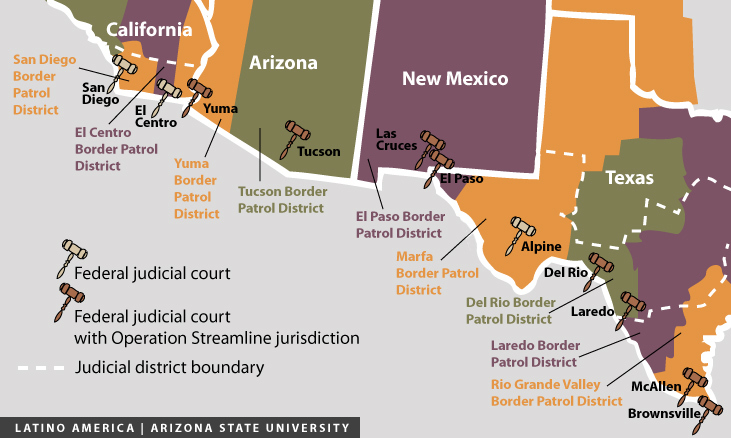 There are five federal court districts with jurisdiction over the border region — each operates multiple courts. 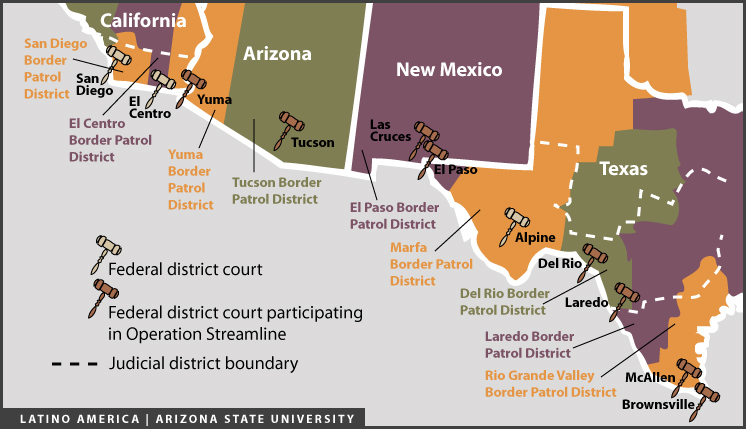 Of the 11 courts along the border; eight of them enforce Streamline or similar programs. The Yuma, Ariz., and Del Rio, Texas, courts have fully implemented Operation Streamline. This means that in Border Patrol sectors they serve, 100 percent of the people agents apprehend at the border will be detained and prosecuted through the Streamline process. Six other federal district courts (Tucson, Ariz.; Las Cruces, N.M.; El Paso, Texas; Laredo, Texas; McAllen, Texas; and Brownsville, Texas) employ partial programs. As a whole, the initiative is referred to as Operation Streamline, although, each zero-tolerance program operates under its own name. Whether Operation Streamline has had an impact – or the right impact – is hotly debated. Supporters say Streamline is working; detractors argue that authorities are going after the wrong people. The U.S. Attorney’s Office in Arizona says expansion of the program will help decrease violence along the border by closing the “revolving door,” on repeat border crossers, including those involved in drug and human smuggling. In a 2008 press briefing, then-U.S. Department of Homeland Security Secretary Michael Chertoff said, that since its beginning in 2006, Operation Streamline caused apprehensions to fall by 70 percent in the Yuma Border Patrol Sector in southwestern Arizona. These numbers have been critical in the debate to expand Streamline to cover the entire border. Chertoff, President George W. Bush’s second homeland security chief, said the program had, “an unbelievable return effect.” He noted that from October to December of 2007, 1,200 illegal border crossers were prosecuted in the Yuma Sector. “And as a consequence, apprehension rates dropped nearly 70 percent,” Chertoff said. “What we see, both statistically and anecdotally, is that when people who cross the border illegally are brought to face the reality that they are committing a crime, even if it is just a misdemeanor, that has a huge impact on their willingness to try again and on the willingness of others to break the law coming across the border,” Chertoff said. However, the Center for Comparative Immigration Studies at the University of California, San Diego, conducted a study between 2005 and 2009 to find out why fewer migrants are choosing to cross the border. It found that the increased costs to be smuggled across the border and the poor state of the U.S. economy were the primary reasons fewer migrants have entered the United States, not enforcement efforts like Operation Streamline. Even a Border Patrol press release issued in July 2007 conceded that while the expansion of Streamline to federal district courts along the border correlates with the decline in apprehensions it is not the direct cause of the drastic drops. “Although not a direct result of the operation itself, the decrease in apprehensions does highlight the success of applying the proper mix of resources, such as manpower, infrastructure, technology and innovative programs like Streamline, to the appropriate areas,” according to the press release. 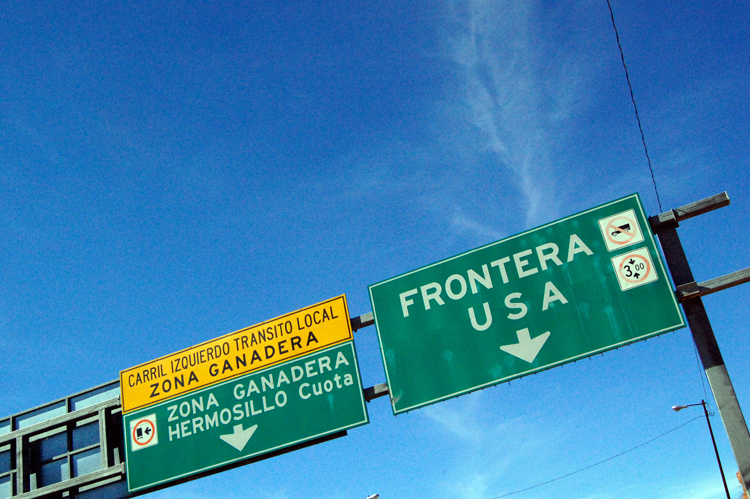 A road sign at the Mariposa border crossing near Nogales, Sonora, Mexico. And U.S. Magistrate Judge Norbert Garney of the U.S. District Court in El Paso says he is seeing the same number of illegal immigrants pass through his courts as always. Supervisory Federal Public Defender William Fry said he is representing just as many illegal immigrants as always in the Del Rio Sector of Texas, where Streamline has been in effect the longest. A policy brief released earlier this year by the Chief Justice Earl Warren Institute on Race, Ethnicity & Diversity at the University of California, Berkeley, concluded that Operation Streamline wrongfully targets migrants with no criminal records, instead of drug traffickers and human smugglers. As a result petty misdemeanor cases overwhelm the border district courts and usurp resources needed to prosecute more serious, violent crimes. “Operation Streamline’s questionable effectiveness, the strain it has put on border district courts, and its constitutional problems add up to a wasteful expenditure of our law enforcement resources along the border,” according to Warren Institute fellow Joanna Lydgate. Immigration caseloads in the border district courts reached unprecedented numbers in 2009, according to the 2009 annual report of the director of the Administrative Office of the U.S. Courts. Immigration-related cases jumped 21 percent nationally between 2005 and 2009. The report said that the 11 Southwest border district courts handled 73 percent of all the immigration cases filed in 2009. Of all the immigration cases filed in the U.S., 80 percent were for illegal entry by an alien, the misdemeanor Streamline charge. Prosecutions of misdemeanor immigration cases have come at an expense: there have been fewer prosecutions of felony re-entry cases and of drugs and weapons cases. From 2005 to 2009, the rate of felony alien prosecutions declined by 16 percent and weapons prosecutions declined by 15 percent, according to data collected by the Transactional Records Access Clearinghouse (TRAC) at Syracuse University. And as the drug wars escalate along the border, the rate of drug prosecutions increased by only 7 percent, according to the 2009 U.S. Court director’s report. Streamline is affecting border crossers— but not stopping them, according to a report by Grassroots Leadership, an advocacy and research group in Austin, Texas. Instead of deterring migrants from crossing, Streamline pushes them to take more dangerous approaches. “Rather than deterring migration—the stated goal of Operation Streamline—increased enforcement tends to cause immigrants to use more remote and treacherous crossing points and creates a market for smugglers and human traffickers,” according to the Grassroots Leadership report released in July 2010. Border Patrol numbers indicate that the number of deaths in the desert continued to rise even as the rate of apprehensions declined in 2009. University of Arizona law professor Marc Miller said initiatives like Streamline only narrowly address immigration issues at the border. Deaths are the “big picture” in the immigration debate, Miller said. But he believes the cost of human lives is often left out of the conversation, and as a result, comprehensive immigration reform is a series of piecemeal initiatives that are neither effective nor practical. One initiative that the Warren Institute lauded in a follow-up report was the Border Patrol’s approach in the Southern District of California, which does not operate a Streamline Program. Instead, border enforcement focuses on apprehending and prosecuting illegal immigrants who have criminal histories while administratively handling and deporting those who cross to find work or reunite with family. It’s a strategy that the Border Patrol agents along the California-Mexico border find most effective. “We choose to prosecute the really bad guys – the people who have a criminal record, the people who have tried to come back into the United States multiple times,” said Border Patrol Agent Jose Morales, a spokesman for the San Diego Sector. Morales said that the San Diego sector apprehended 120, 000 border crossers in 2009. But prosecuting every person who enters Arizona illegally is what U.S. Sens. John McCain and Jon Kyl, R-Ariz., have proposed, even before detailed cost analysis has been done. Expanding Streamline is a focal point in the senators’ 10-point federal border enforcement initiative. The proposal calls for the government to fully fund and support Streamline in both of Arizona’s Border Patrol sectors, which would mean making Tucson an all-Streamline sector, like its neighboring sector, Yuma. The senators’ proposal states that repeat border crossers should be required to spend a minimum of 15 to 60 days in a federal prison. The Tucson Sector is the busiest in the nation. On any given day Border Patrol agents will apprehend between 400 and 600 illegal immigrants, of whom about 10 percent will be processed for Streamline, said David Jimarez, the Tucson Border Patrol’s public information officer. In the Yuma sector, Streamline is fully implemented, which means that every person apprehended at the border in Yuma goes through the Streamline process. 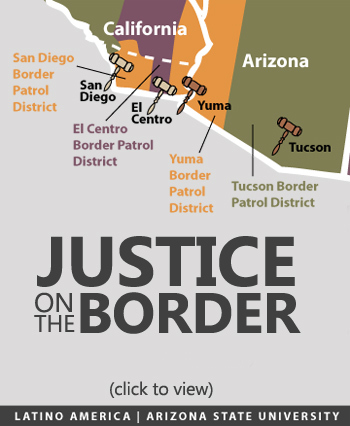 The Tucson Sector launched the Arizona Denial Prosecution Initiative, a variation of Streamline that caps the number of migrants prosecuted per day at 70, in January 2008. In January 2009, Kyl asked the Senate to produce a report detailing how much it would cost to fully implement Streamline in Arizona. The report has yet to be delivered. Wilder acknowledged that an expansion of Streamline would require more judges, defenders, prosecuting attorneys and other court personnel. In addition, there would have to be more detention facilities. How much it all would cost remains unclear without the report, he said. But Kyl and McCain gave a glimpse of the magnitude of costs in May when they tried to tack $200 million for an expansion of Streamline in Arizona onto an emergency appropriations bill. The Senate rejected the amendment. While the cost analysis still hasn’t been done for Arizona, Grassroots Leadership in Texas estimated the cost of detaining and incarcerating Streamline defendants for 2009 was $320 million. The group estimated it has cost $1.2 billion dollars to operate Streamline in the Texas border districts over the past five years. Modest estimates for the total current costs of operating Streamline in Arizona fall between $10 million and $11 million per month, according to calculations by Tucson-based federal public defender Heather Williams. Included in those estimates is $3.6 million spent on defense attorneys for the immigrants; almost $3 million is spent on contract attorneys. On average, 87 defense attorneys are contracted each month at $110 an hour to represent Streamline defendants each week. Each lawyer spends about six hours with clients per day. Also each week there are 12 federal public defenders present to represent Streamline clients costing $573,000. Detention costs would be high. Currently, it costs $70.75 to detain a person for one day in Arizona. In 2009 16,584 people went through Streamline in the Tucson court and 1,877 in the Yuma court, according to figures provided Williams and Border Patrol officials. The average sentence for defendants was about 30 days. This means the annual cost for detaining and incarcerating Streamline defendants last year was almost $40 million dollars. All of those costs would increase dramatically if Streamline is fully implemented in the Tucson Sector where the Border Patrol reports that only 10 percent of those caught currently go through the process. For example, an expansion of Streamline in the Tucson sector would cost over a billion dollars in detention costs alone, according to News21 calculations based on cost figures provided by Williams and the Border Patrol. Miller, the law professor at the University of Arizona, warned that costs could increase year after year. Miller is unconvinced that the general public will support spending billions of dollars to build new facilities to prosecute and incarcerate migrants whose only crime is crossing the border. An alternative proposal by Arizona’s senators calls for a partial expansion of the program, which would bump the number of defendants from 70 to a minimum of 200 in the Tucson Sector. Fully implementing Streamline would mean prosecuting all of the migrants the Tucson agents apprehend along the border every day. Either way, expansion would require a new federal courthouse, more detention and prison centers, additional magistrates, district judges, federal marshals, Border Patrol agents, attorneys, interpreters and courtroom clerks. Judge Philip Martinez, of the U.S. District Court in El Paso, is skeptical that a full implementation is possible.